What happens when winter weather hits and expensive outdoor pieces aren't properly protected? The thing that we like to protect against most at Mr. Shrinkwrap- costly damage! 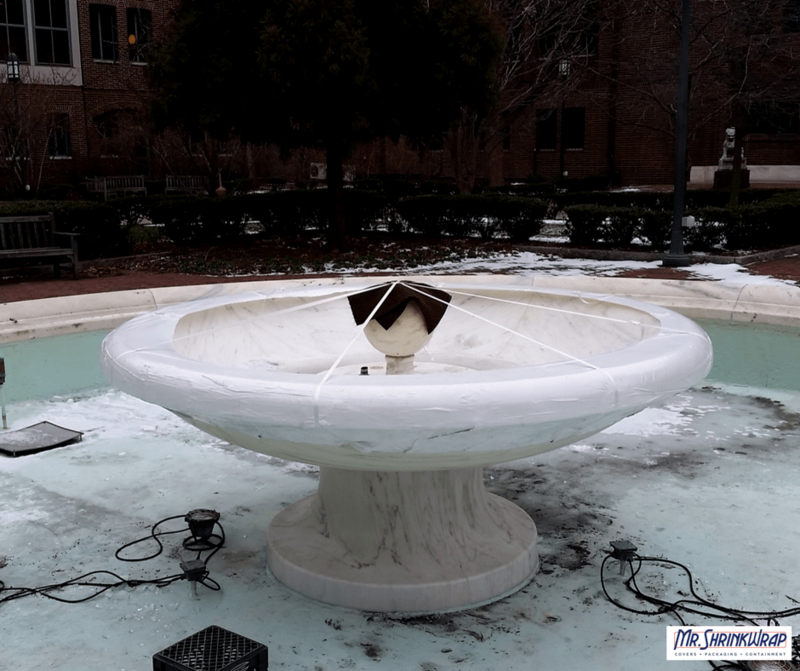 Today, we're taking a look at how we protected this expensive marble fountain at the University of Pennsylvania. 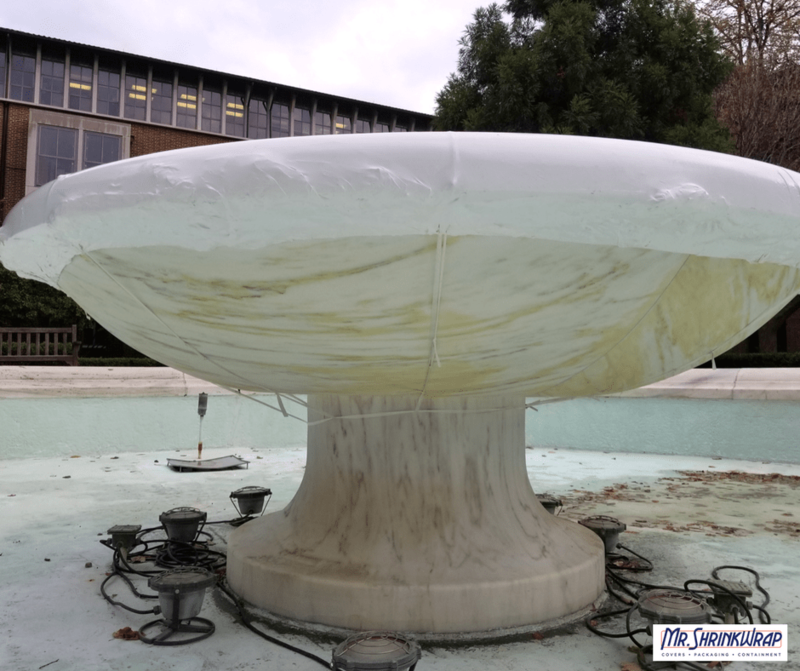 The fountain gets wrapped every year for the winter season to prevent damage from freezing water and falling debris. While circular objects such as this fountain can be tricky to wrap, it can be done! Our Mr. Shrinkwrap service crew was able to provide a tight and secure shrink wrap cover by using a crosswoven poly strap to provide structure in a creative way. The strap was then passed over the center of the fountain a few times, making the top-down view similar to a sliced pizza. A perimeter strap was installed below the lip of the fountain, connecting all the straps and ensuring a secure hold. 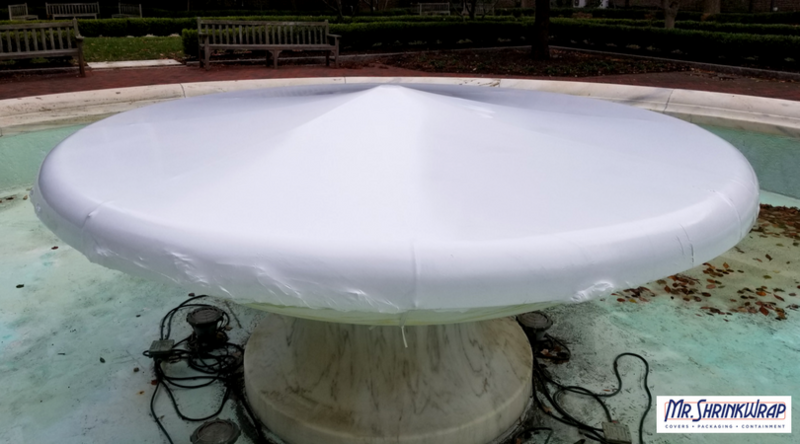 Once the strap-structure was tightened, shrink wrap was pulled over the fountain, trimmed, and fused into place. The service crew then added some reinforcing strap below the perimeter strap to ensure an even tighter final product. The shrink wrap was then shrunk and the project was complete. 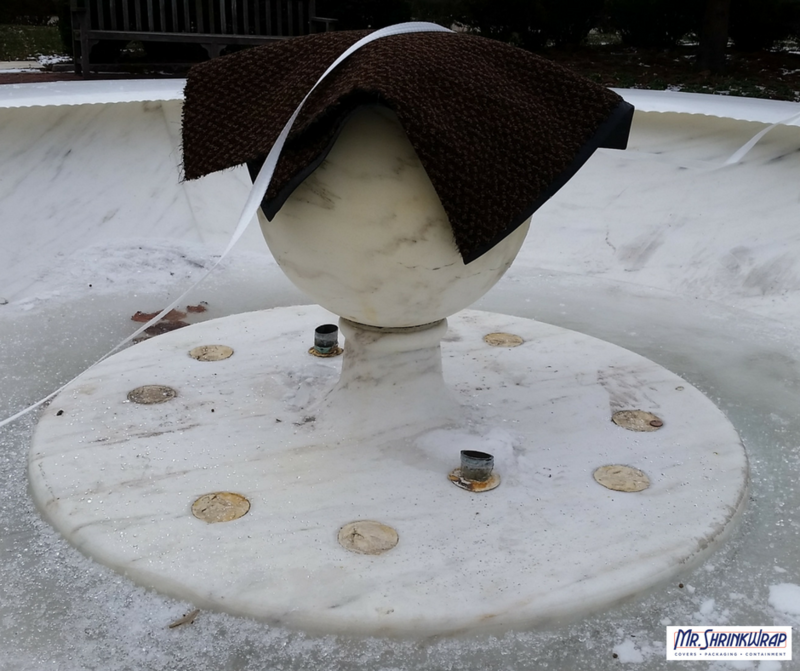 Another year of protection complete for this marble fountain! When it comes time to put away the outdoor furniture, Mr. Shrinkwrap can help you protect your investment and keep your assets looking clean with outdoor shrink wrap products or services. Our on-site service crew shrink wraps tables, chairs, outdoor kitchens, gazebos or any other outdoor amenities that need protection from the elements. We work throughout the tri-state area of Pennsylvania, Delaware & Maryland and are happy to come to your home or dry storage location. If you’re interested in having us provide on-site shrink wrap services for wrapping your assets, please check out this page for more information. We also supply premium quality 100% virgin resin shrink wrap in varying lengths, widths, and mil thicknesses for the shrink wrap do-it-yourselfer. We recommend 6 and 7 mil shrink wrap for outdoor furniture wraps. We also supply a full line of installation accessories and everything you need to complete your shrink wrap job, start to finish.